The guitar that George Harrison was photographed with at The Beatles' final appearance at The Cavern Club in 1963 is to be sold at auction. The Australian-made Maton Mastersound MS-500, is expected to fetch in the region of £300,000 to £400,000 when it is sold in Wiltshire next month. It was played by Harrison during the summer of 1963 while his regular guitar was being repaired. He was so taken with it he continued to use it for more performances. After Harrison returned the Maton guitar to the repair shop, it was bought by Roy Barber, the guitarist with Dave Berry And The Cruisers, who went on to have hits with Memphis, Tennessee and The Crying Game. 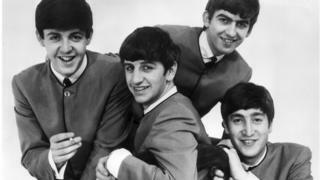 The guitar remained in storage for several decades but after Barber's death in 2000 it was exhibited at The Beatles Story museum in Liverpool and auctioned in New York in 2015 for $485,000 (£373,000). The instrument, which is being sold by a UK private collector, will be auctioned at Gardiner Houlgate auctions in Corsham, Wiltshire, on 12 September. A pair of customised Ray-Ban sunglasses from the late 1970s to early 1980s made especially for Harrison, who died in 2001, are also in the sale and expected to fetch more than £3,000. Auctioneer Luke Hobbs said: "This guitar is something very special - a direct link to the early days of Beatlemania. "We're expecting interest from right around the world."